Offering you a complete choice of products which include shimpo servo gearbox and vrsf shimpo servo gearbox. The VRT series sets the new standard for applications requiring extremely high-torque ratings and rigidity. The compact design and hub-style output is ideal for equipment requiring high speed, high precision indexing movement. The torsional stiffness and the low backlash of the planetary gearing combine to provide outstanding positioning accuracy. With a backlash rating less than 3 arc-minutes and exceptional torque handling capabilities, the VRT offers a high performance robust planetary solution for OEM customers. The VRT reducer is often used for larger indexing applications and dial tables commonly found in packaging and filling equipment and assembly automation systems. 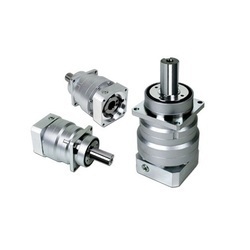 We are the leading suppliers of Vrsf Shimpo Servo Gearbox made from high quality material.